I am having a blast playing in the challenges at Ellen Hutson this week. BTW... can't wait for the games to begin in Rio. I paired the circles and dots with a super cute die cut by Winnie & Walter. To finish the card I added a bit of Lime Burlap String and a few Crystal Drops. This card is bright and colorful, but it would also work for a "manly" card. Really love this card. Thanks for the inspiration! 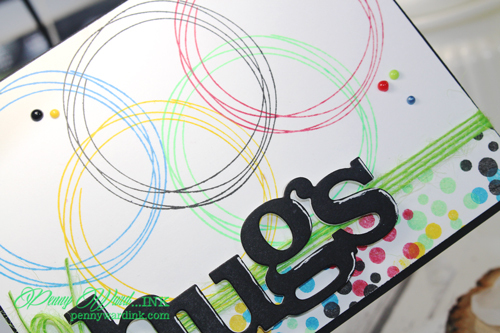 I am totally in love with this card - those circles look so cool!! What a fabulous card with all its' way cool design elements!! You are a star! !